I’m Molly and i’m 22 and live in Chelmsford, Essex. Throughout my time at school I was a keen runner, taking part in every Cross Country or athletics event. I absolutely loved the feeling of getting in from training, high on endorphins, ordinarily plastered with mud splattered. In Sixth Form I ran the Brentwood Half Marathon as a fundraiser for Havens Hospice, and finished in 1:44:48. On moving away to university in Falmouth, Cornwall, my running took a slight back seat for various reasons; making new friends, work and perhaps I was slightly intimidated by the huge hills!!! I did, however, join the running society on a weekly run during my first year. In 2015 I ran the Morrisons Great Birmingham Run in 1:40:44 and was really chuffed as I’d done minimal training. My second year away is when things started to go downhill quite quickly. I lost a lot of weight, and with the support of my wonderful housemates and boyfriend I was encouraged to see a doctor, where I was diagnosed with Anorexia. I was too underweight to function properly, feeling dizzy and surviving off minimal, but was sadly blind to it. I would walk everyday, but I couldn’t physically run for any length of time. That summer I came home and decided, kick started by the support services in Falmouth, that I needed to do something about it on my own. I had a wonderful bubble of love from family and friends that enabled me to start my recovery!! Now, having graduated in summer 2018, I am back and fighting fit. I decided to sign up for the RunThrough Queen Elizabeth Olympic Park Half Marathon on the 10th February and use it to try and raise money for Beat UK as an extra incentive to train and more importantly fundraise for a brilliant charity. I trained really hard and nourished my body, managing to get a PB at 1:28:37! I was over the moon and had really caught the “running bug” again. I had given something back and rediscovered my love for running! I thought that all the marshals were brilliant and the event was so well organised so instantly decided to sign up for another RunThrough event, the Victoria Park Half Marathon on the 9th March. 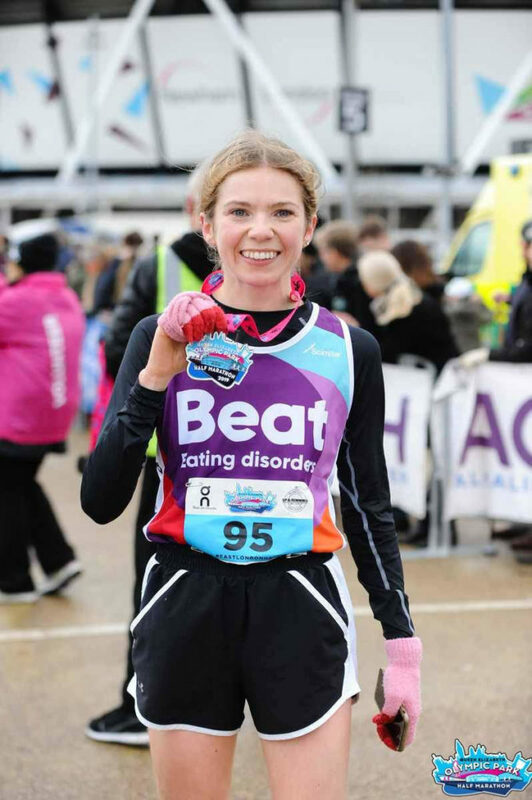 I decided to extend my JustGiving page to see if I could raise even more money for Beat! I completed it in 1:28:50, which I was pleased with considering the blustery conditions. I, incredibly, raised £840 + £143.75 gift aid for Beat UK over the two half marathon races. Beat UK’s work is invaluable! I feel very lucky to have recovered with the help of my wonderful family, housemates and friends, but some are not so lucky and still need a lot of support, which Beat can provide. Beat mainly focus on getting people with eating disorders into treatment as early as possible, as the sooner someone gets help, the better their chance of fully recovering. It feels like a real achievement to be back healthy and able to run again better than ever! !